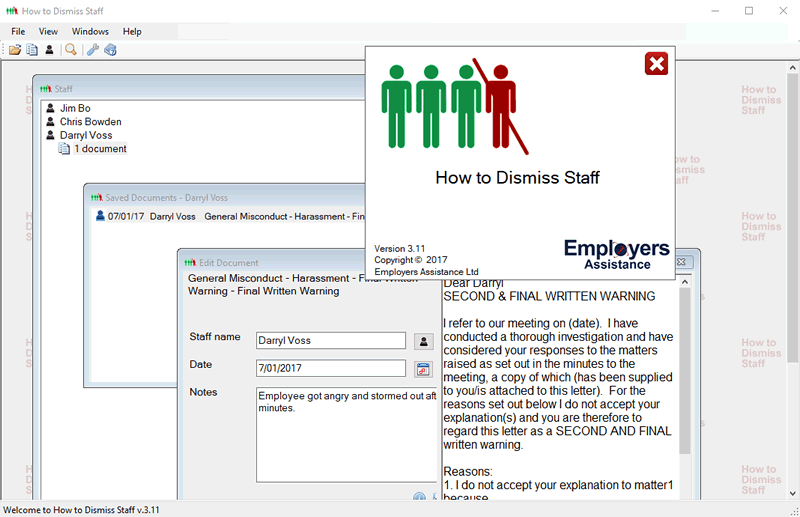 How to Dismiss Staff: the software that will help you manage any and all staff disciplinary issues however minor or serious. The software does it all for you and is very easy to use. In order for a dismissal to be legal it has to be substantively justified (ie a genuine reason) AND undertaken in a procedurally fair manner. One of the biggest downfalls in the discipline and dismissal minefield for managers and business owners is the latter part; the process. Failure to follow the correct legal process renders the disciplinary action invalid and exposes the employer to a potentially successful personal grievance. Follow the steps as outlined in the software to ensure you get the process correct. Simply select the reason that you are dissatisfied with the employee (eg. lateness, misconduct, poor performance...). 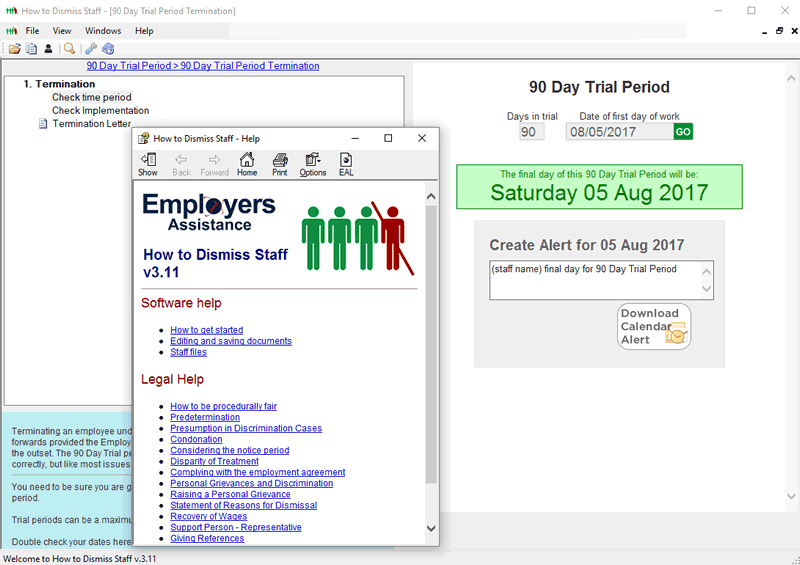 The software then provides you with the steps you need to take to warn and/or dismiss the employee. At each step, it gives you comprehensive explanations of what you need to do, and how to do it. All the letters have been written for you, and it gives you the words to use at meetings. For all Employee issues - words to use at meetings - customised letters (over 400 of them!) - Easy step by step procedure to ensure you conform with the requirements of the law, and follow a fair process. This is PC based software and requires Windows XP or higher, full compatibility with Windows 10. "..Great service and advice over the years has allowed us to make informed decisions in regards to dealing with employees..."